Today I have a Gate fold card using Acetate. 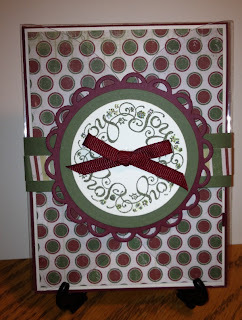 I recently did a fun Girls Night Out with a mini card class. It included 2 cards a treat box for the girls to create. This is one of the fun cards they made. with Dazzling details to highlight the stars and holly. Topped it off with a bow and it was complete. Just slide the band off add some writing and this Christmas card is ready to send to your friend or family member. Love the idea of using acetate for this card!